Now you won’t have to look further than the Uniqlo vending machine at airports to follow your mom’s order to stay warm. You’ll find them at SFO, OAK, IAH and LGA. 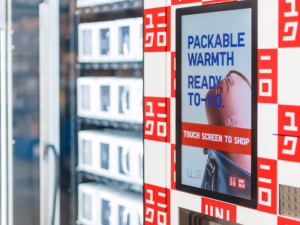 The Japanese clothing retailer has installed 10 “Uniqlo to Go” machines in airports and malls across the States in the past few months in an effort to expand its U.S. footprint. They’re stocked with ultra lightweight down jackets (apx. $70) and HEATTECH tees (apx. $15), perfect for layering under just about everything.